6:30 p.m - 10:00 p.m.
A brand new event, presented by the City of Grosse Pointe Foundation, the Family Jingle and Mingle presents family fun, activities and refreshments immediately following the Annual Tree Lighting celebration. The event also presents an opportunity to join friends and neighbors to celebrate the Holiday Season with The Village in full holiday splendor. Activities are compliments of the City of Grosse Pointe Foundation, the annual Village Christmas Tree sponsor. The K-Line Trolley will have a special run from 5 p.m. to 10 p.m. on Friday, Nov. 16. Riders can enjoy a free -- and fun -- ride on its normal route down Kercheval Avenue, to and from Grosse Pointe Park and Grosse Pointe Farms, stopping in The Village at St. Clair Ave. and Kercheval in both directions. 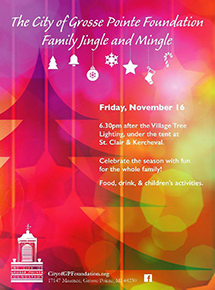 Invite your friends and neighbors to come to the The Village to kick off the holidays with a Friday evening of fun in the center of Grosse Pointe. This holiday trolley ride takes you right to the spot of the Tree Lighting and Family Jingle and Mingle. The trolley is sponsored by the Grosse Pointe Village Downtown Development Authority.